Tribo-Chemie´s wax free release agents are not only suitable for conventional spraying but also for minimal- und micro spraying! Clean die frames and vents no build-up of residues, clean and unblocked nozzles allow you a trouble-free process. Additional advantages: Castings produced with Isolat® products, can be painted, powder coated, welded and/or glued. - Isolat® 80 G Beads consist of a wax with a micro-milled graphite content of 18 - 20%. The product is non-sticky, dust free, environmentally friendly, free flowing and anti-static. - The Beads are also suitable under tropical conditions and can be used in all approved beads dispensers. - A reliable and precise application is achievable in conjunction with TRIBO BEADS DISPENSER 3D for minimal dosing (exact dosing below 0,2 g / shot is indeed possible). Our graphite containing lubricants (Graphitex®) for forging of steel, aluminium and titanium are well known in the market for more than 30 years. Constant development and improvement of formulations guarantee forging lubricants with improved process reliability. Tribo-Chemie´s milling technology and formulation know-how ensure well balanced products in a wide variety to cover the customers’ requirements. 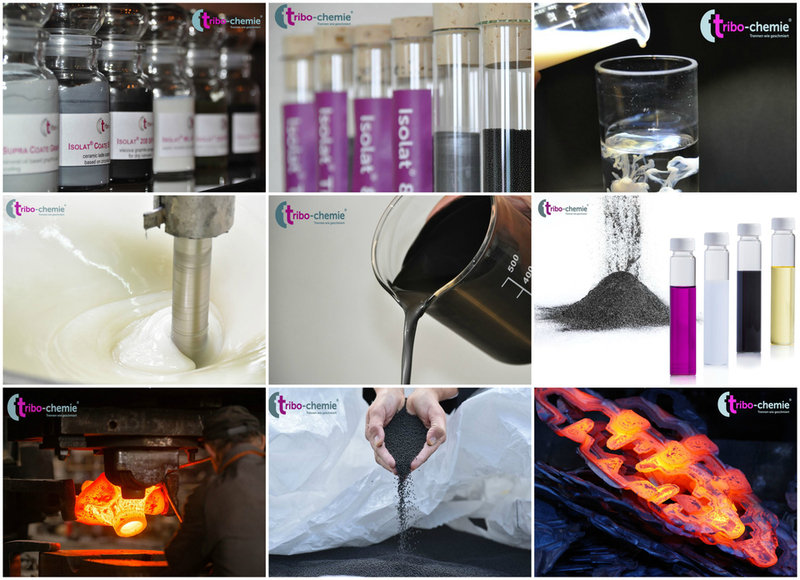 Due to our own laboratory and our on-site production we are flexible and innovative, which enables us to produce customized products.